Of the year that we were abroad, we spent three months with “Heartbeat Vietnam” in Saigon, traveling to the Mekong Delta and meeting the children who had severe heart defects and didn’t have access to medical care, nor the funds to pay for a surgery. The surgery to repair a heart defect in Saigon averages about $2,000 USD. If the average subsistence farmer is earning a $1/day, then you can see how impossible that would be. Children would just turn blue and eventually die without help. We were able to raise $20,000 from friends and family to get 10 children to the hospital, and continue to support the program with an annual sale of Asian textiles and scarves. 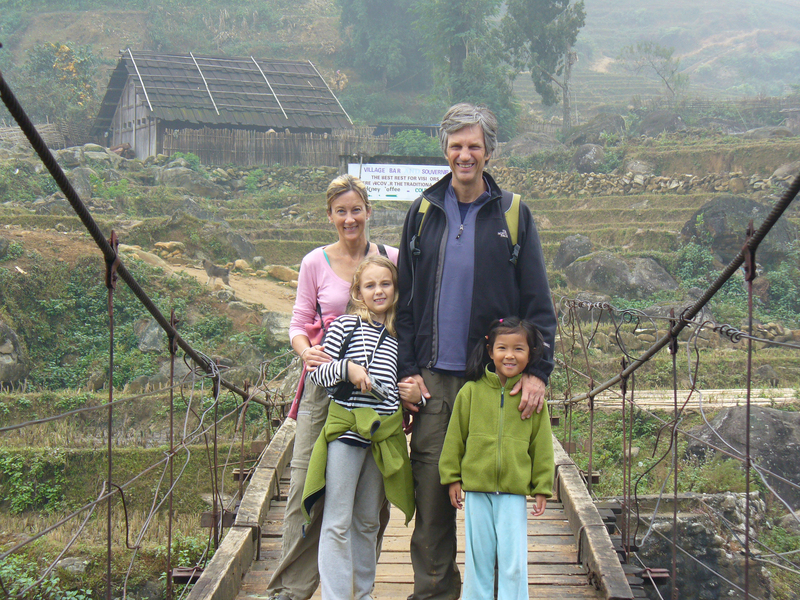 We also taught English in two countries – to children Hanoi and to monks in Laos. Through the scarf sales, we have also been able to send support to an orphanage in Laos. Being with my children as they discovered their own compassion and ability to make a difference in a life of another child was incredible. It can get cold in Laos, and many children don’t go to school in the winter because they don’t have warm clothes or shoes to walk the long way to get there. So, we collected clothes, and with a local teacher who could tell us who the neediest children were, we were able to clothe a few dozen kids in a small village in Northern Laos. One girl, who walked the farthest to school, had feet that were bigger than the shoes we had brought with us. My daughter looked at her for a moment, then bent down, took her sneakers off her feet and gave them to the girl. I like to think that those shoes are still somewhere in that village keeping a child’s feet warm. I would say there were three major challenges. 1. The health of my family was an everyday challenge. NuNu was four and Isobel was eight when we began our trip. I wasn’t as prepared as I should have been for the altitude sickness in Tibet. For the first few days Bob was violently ill, NuNu was throwing up, Isobel couldn’t walk, as her legs were too weak from lack of oxygen, and I had a massive headache. Malaria was also a consideration, and while I came prepared with Malarone, we never did end up using it. As soon as we landed in a new country I would ask the ex-pats about the malaria situation – after weighing the risk vs. the toxicity of the medication, we just took the usual precautions for preventing mosquito bites. 2. Finding places to volunteer. Since we didn’t work though an organized volunteer program, it was critical to find people whom we could get to know and trust. We learned that money can get into the wrong hands and well-intentioned travelers and tourists can think they are doing a good thing, when in fact they can inadvertently create a lot of damage. Ex-pats were the best source of good information about who to trust and who to stay away from. Again, there were places we visited where the need was possibly the greatest, but our hands were tied, as in Myanmar. 3. No doubt, we became closer as a family. However, being together 24/7 for weeks at a time will either bring you much closer to your spouse or land you in divorce court. I happy to report that Bob and I are still married and are better off for having spent that year together. We traveled by train, plane, automobile, tuk tuk, motorbike, boat, canoe, bicycle and by foot- and that was half the fun. Because it wasn’t planned out ahead of time, we had the luxury of creating the travel plans as we went. With the exception of getting stuck enroute in the old, bug infested airport in Bangkok for 48 hours, winging it worked pretty well. Any family with children who wants to have an adventure. Giving ourselves a year allowed a tremendous amount of freedom, but certainly, a version of this trip could be done in less time. This entry was posted in Helping kids, Medical aid. Bookmark the permalink.